Maggie Muggins Designs: Another Thing to Crave. So one of my dear friends and her husband dropped off a movie and some treats for my Husband on his birthday. Thanks guys! Unfortunately for me - the treat means a new craving. I'd NEVER had Samoas before. I know, some of you are in complete shock! Don't forget - I'm Canadian and these are one of the American Girl Scout cookies. Let's just say I'm in trouble. Pregnancy and something only available once or twice a year do not mix well. So for all of you Samoa cravers - here's a recipe. I haven't tried it yet myself. But I had to search and make sure it was out there. I'll let you know how these turn out once I try it. P.S. 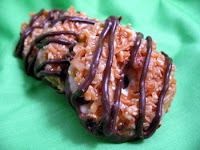 For those Gluten Free friends of mine - here's someone's tips on making the Gluten Free version of this recipe: Gluten Free Samoa Recipe. I LOVE Samoas! I can't believe you'd never had them...even in all your college years in the U.S.
How'd the homemade samoas recipe turn out?